The University of Cincinnati is made up of a large and diverse community where tens of thousands of students, faculty, and staff come together each day to learn and live alongside one another. Our community embraces diversity and inclusion as core values that empower individuals to transform their lives and achieve their highest potential. We offer a challenging, yet nurturing intellectual climate with respect for the spectrum of diversity and a genuine understanding of its many components — including race, ethnicity, gender, gender identity and expression, age, socio-economic status, family structure, national origin, sexual orientation, disability, and religion — that enrich us as a vibrant, public, urban-serving, research university for the 21st century. Come see how our community can support, encourage, and help you enhance your strengths and lead you to success. 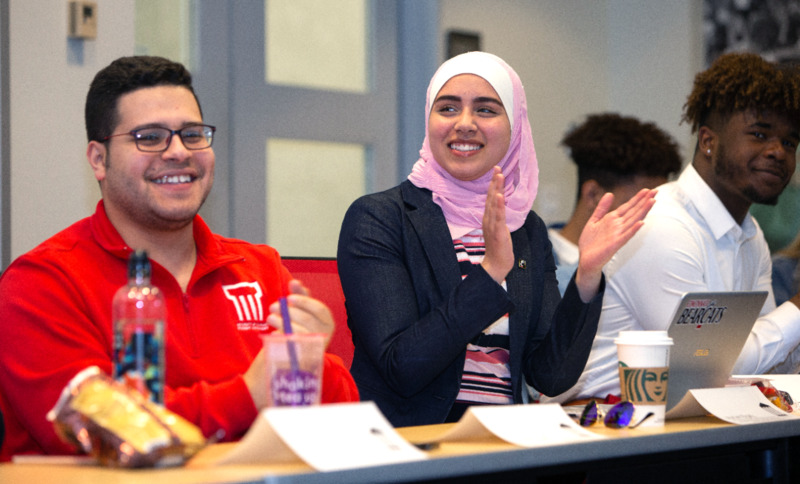 The Multicultural Recruitment Team in the Office of Admissions plans recruitment and yield events that serve students of diverse racial and ethnic backgrounds. The team members also act as liaisons between identity centers across campus and the community at large. If you have questions or concerns, please first reach out to the admissions counselor assigned to work with students from your area. Our model allows each admissions counselor to know the great and unique factors about your hometown and high school in an effort to provide the best support possible. To learn more, visit Corntey's staff page. To learn more, visit Delonte's staff page. To learn more, visit De'Recco's staff page. To learn more, visit Travis' staff page. To learn more, visit Dontavius' staff page.